There was a time when the arcade was the focal point of every advancement our hobby would receive. Whether is was technology or game design, you saw it there first. I go over the games that had the biggest effect on me through the years, and discuss why I cared so much for them. We will be looking at: Thunder Blade Spider-Man The Video Game Virtua Cop 2 Daytona USA Gunblade NY Outrunners Golden Axe The Revenge of Death Adder House of the Dead Sega Rally OutRun 2Be sure to check out my Facebook page for random thoughts and reviews! https:www.facebook.comsegalordxCheck out my pals over at the Sega Saturn Shiro Podcast. https:segasaturnshiro.podiant.coIf you want to rep the Sega Lord X logo, check out the merch page! https:segasaturnshiro.threadless.comAs always, thank you guys for all your support! I'm often asked about my feelings on how the Sega systems(and add-ons) stack up against one another. Which is my favorite, or where a certain machine ranks in the hierarchy. In this episode, I shed most of the negativity and just rank the machines based on what I enjoyed the most and a brief explanation of why. I'm now on Patreon! Help support the channel. https:www.patreon.comsegalordxCheck out my Sega Lord X merchandise page! https:segalordx.threadless.comIf you would like to support the channel directly: https:www.paypal.mesegalordxHead over to Facebook to hear me ramble about various things: https:www.facebook.comsegalordxOpening animation done by: https:www.facebook.comkevin.bhall.14Episode Notes: Opening SEEEEGAAAA from Astal on the Sega Saturn. The episode closes out with the end credits music from Panzer Dragoon 1. I included the 32X and Sega CD mainly because of their libraries. They both have games no other Sega mainline system received. I finally am capturing decent Dreamcast video. Hopefully I will be putting out more videos of it. The Pico was a device aimed at younger gamers that played games using a tablet like interface.It actually had a number of cool games, I just haven't played enough of it to give you a fully formed impression.I realize that combining the Game Gear and SMS will ruffle some feathers, but it's more to do about their similarity in games than anything. I played many later SMS games on my GG via a converter as well. The Genesis wasn't the only machine to enjoy these great games. Let's look at some popular Genesis games that were also on the Sega Master System.This is part of the videos from the first run of my channel. They have technical and editing issues that I am not going back to fix. They are presented as they are. Check out my current content! Covering the platformers on the Genesis was a huge undertaking. Be sure to check out part 2 for more games. This is part of the videos from the first run of my channel. They have technical and editing issues that I am not going back to fix. They are presented as they are. Check out my current content! 100 N64 games - in high quality "high definition". "High definition" refers to the fact that the graphics have been uprezzed to 1280 x 1024 - and as a result, some of these games may look quite a bit better than you might remember.Some real classics in here ... along with some classic turkeys. Enjoy! The Sega Saturn would have its very own arcade hardware released in 1994 in Japan, and worldwide in 1995. Dubbed appropriately, Titan, this board would see a surprising amount of support in Japan. Despite the many great games produced there, the arcade hardware would tank in the west. It's most notable game in the NA and Europe being Die Hard Arcade.Be sure to check out my Facebook page for random thoughts and reviews! https:www.facebook.comsegalordxCheck out my pals over at the Sega Saturn Shiro Podcast. https:segasaturnshiro.podiant.coIf you want to rep the Sega Lord X logo, check out the merch page! https:segasaturnshiro.threadless.comThe Sega Saturn Junkyard is always great to stop by. https:www.facebook.comthesaturnjunkyardOpening animation done by Kevin Bhall. Contact him here: https:www.facebook.comkevin.bhall.14 https:www.youtube.comchannelUC7KHY9qhTX_073o9JtuZ-vQAs always, thank you guys for all your support! There was no shortage of awesome Japanese Sega Saturn games to buy during its run. With a library of 1000+ games, it was easy to miss a few. These are some of the games that would slip past me despite my devotion to the system. I would discover them a few years later, and finally see if they were any good. NOTES: 1. I added the Japanese names of these games in text where applicable. I can't pronounce Japanese words worth a crap.2. This originally was an episode meant for my last channel. I cleaned it up and finished it, but you may notice I intended it to have a different title(Obscure Japanese Sega Saturn Games).Games Covered: Whizz Hissatsu! Death Throttle Lode Runner The Legend Returns Lode Runner Extra Chaos Control Chaos Control Remix Mechanical Violator Hakaider Steeldom Mighty Hits Ninja Jajamaru-kun Ninpen Manmaru Mizubaku Daibouken I'm now on Patreon! https:www.patreon.comsegalordxCheck out my Sega Lord X merchandise page! https:segalordx.threadless.comIf you would like to support the channel directly: https:www.paypal.mesegalordxHead over to Facebook to hear me ramble about various things: https:www.facebook.comsegalordxThanks for watching! SUSCRÍBETE:https:goo.glMqmhKQ En esta Colección veremos los mejores juegos Arcade de DATA EAST. Data East fue una empresa de videojuegos japonesa también conocida como DECO (Data East Corporation). Su Central estaba en Tokio pero también tenían su subsidiaria en California. (EEUU).En esta Lista podremos encontrar grandes títulos de los 90 muy conocidos como Tumble Pop, Windjammers, Street Hoop, Caveman Ninja... pero también encontraremos otros títulos menos conocidos que fueron grandes Arcades. Tambén incluye grandes títulos clásicos de los 80 como Karate Champ, Heavy Barrel, Bad Dudes, Sly Spy, RoboCop, Karnov o Atomic Runner Chelnov. A look at Sega retro gaming on the Xbox 360 and Xbox One platforms.A few notes about this episode. 1. Most of the games here are well below $20, with many on sale at times for a few bucks. 2. Shenmue 1&2 Collection is on the Xbox One, but I wanted to cover that elsewhere. 3. In my experience, the online multiplayer in the Sega Vintage Collection is much better than in the Sega Genesis Collection. 4. Panzer Dragoon Orta is $9.99 on Xbox Live. 5. Sega Rally 3 appeared on the Xbox 360 and was delisted as well. I unfortunately do not own it. 6. Xmas Nights is included in Nights for the 360 as an unlockable. Check out my Sega Lord X merchandise page! https:segalordx.threadless.comIf you would like to support the channel directly: https:www.paypal.mesegalordxHead over to Facebook to hear me ramble about various things: https:www.facebook.comsegalordxThanks for watching! 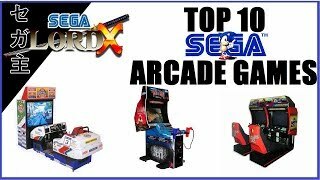 Sega arcade games are among some of my favorite games of all time. Unfortunately, many of them are still locked away in the arcade with no official home release. The games you are about to see are some of the games that are on that list, and I would love to see come home in a faithful conversion. I hope you guys enjoy it!I'm now on Patreon! Help support the channel. https:www.patreon.comsegalordxCheck out my Sega Lord X merchandise page! https:segalordx.threadless.comIf you would like to support the channel directly: https:www.paypal.mesegalordxHead over to Facebook to hear me ramble about various things: https:www.facebook.comsegalordxEpisode Notes:1. I used a combination of emulators for this episode. I used Supermodel for the Model 3 games, Nebula Model 2 for Desert Tank, Demul for Planet Harriers, and MAME for the rest. 2. Planet Harriers emulation is very poor. Many graphical and sound problems. It's good enough to get an idea what the game is about, however. 3. I use to own a Sega Super GT arcade unit about 10 years ago. I was forced to sell it in a move. One of my biggest regrets ever. It was pristine. 4. I used the Space Harrier music from the 32X version for Planet Harriers because of the sound problems. 5. I used music from Sega's Indy 500 in the opening description of the episode while Daytona 2 was playing.